The paper presented was a continuation of work undertaken by MSc Project Management for Construction student (now graduate) , Jodie Collison, and was co-written by supervisors Dr Emmanuel Aboagye-Nimo, Dr Kevin Wyche and Dr Hannah Wood. 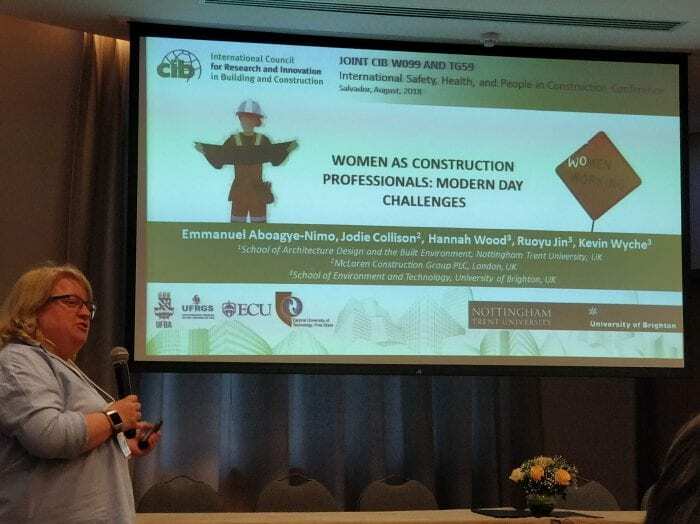 The paper focused on the huge potential for women to work as construction professionals, which would help with the skills gap the industry currently faces. However, in discussion with women currently working in industry, it is clear there are a number of factors that both deter women from joining the industry in the first place as a career choice, or lead to women leaving the industry before progressing to more senior roles. The paper presented a number of recommendations to improve recruitment, retention and progression of female construction professionals, with particular emphasis on flexibility and support around career breaks and caring responsibilities. This would not only benefit women in construction, but everyone in the industry. This entry was posted in Construction, Life at Brighton, Postgraduate, Research, Uncategorized.